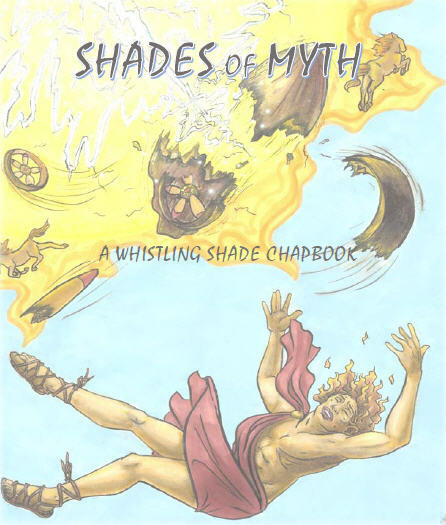 Shades of Myth contains 16 original poems on mythological or legendary subjects, from Icarus to Adam, Persephone to Guinevere. The chapbook will have a limited run of 50 copies, so snap these babies up while you can! Poems by: Sharon Chmielarz, Margaret Hasse, Mike Finley, Melanie Richards, Sawyer Johnson, Kimberly Nunes, Katherine Givens, Tayler Boelk, Leisha Douglas, Benjamin Harnett, Mina Le, and Michael Patrick Emery - plus pieces by Whistling Shade editors Julian Bernick, Rebecca Jones and Joel Van Valin.